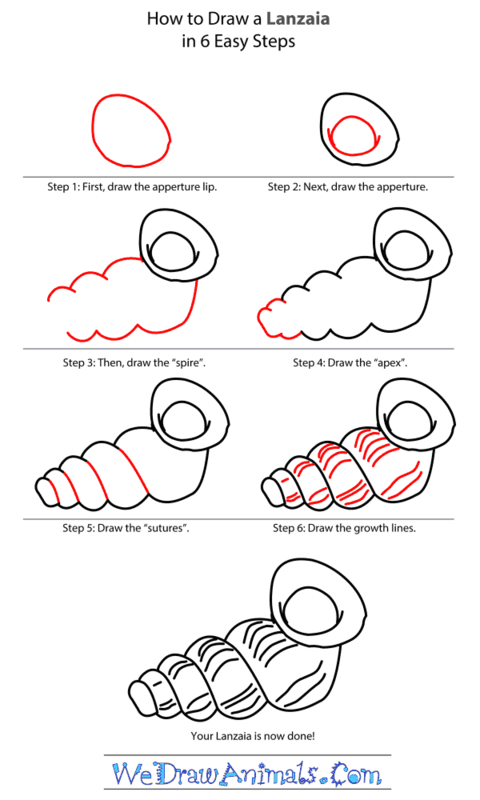 In this quick tutorial you'll learn how to draw a Lanzaia in 6 easy steps - great for kids and novice artists. At the bottom you can read some interesting facts about the Lanzaia. 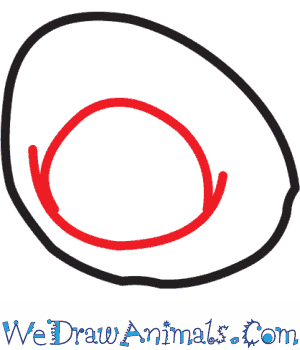 Step 1: Let us start by drawing a slanting egg- shape to show the lip of the Lanzaia’s shell. 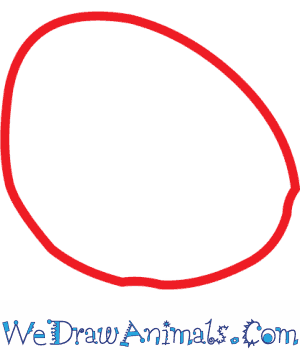 Step 2: Next, draw the opening in the shell using a rough circle and two small curved lines on either side of it as shown in the image. 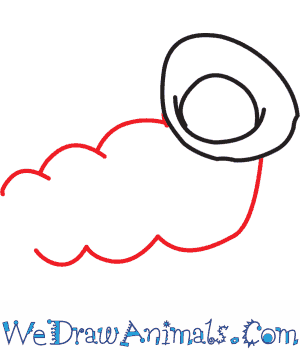 Step 3: Now, draw the spire of the shell using wavy lines that almost look like the outlines of a cloud. Step 4: Add more small curved lines to complete the apex or top of the Lanzaia’s shell. 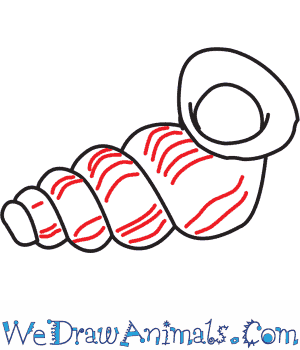 Step 5: Draw slanting lines to show the groove patterns of the Lanzaia’s spiral shell. 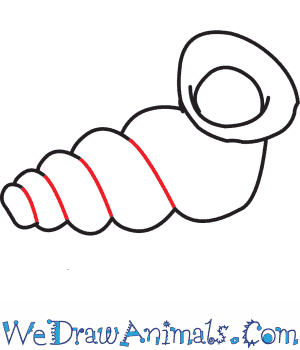 Step 6: Use short lines to show the curved texture of the shell. 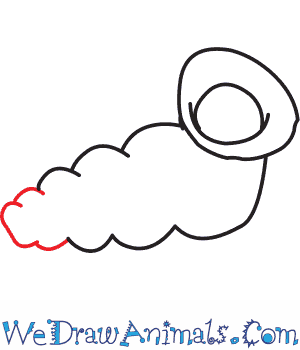 Now that your drawing of the Lanzaia is complete, you can start coloring it. The Lanzaia skradinensis is a tiny snail species native to Croatia, a country in the Balkans region of southern Europe. It lives in freshwater springs found inside of caves. In fact, there are only two springs in the whole world where scientists have found this species of lanzaia living. The lanzaia skradinensis is a critically endangered species, meaning it is endanger of going extinct in the wild very soon. Lanzaia skradinensis was only discovered as a distinct species in 1992. Each summer, thousands of tourists visit the springs where lanzaia live to swim and have fun, but this can hurt the snails. Groundwater pollution from sewage and city waste water is another threat to the lanzaia. Lanzaia skradinensis was added to the IUCN’s Red List in 2012. The lanzaia has a pretty, spiraling shell that tapers to a point — not unlike you might imagine a unicorn horn would look. Very little else is known about Lanzaia skradinensis. Scientists don’t really know about its behavior or how it breeds. Let’s hope they are able to research this special snail more thoroughly before something happens to make it go extinct.